Will there be an update to Android 5 “Lollipop” for the 50 Diamond? Will it be available for existing devices? Well, it's currently hard to say. 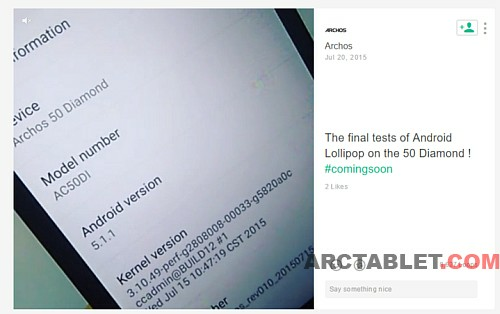 I'd post for reference the Android 4.4 Kitkat promised by ARCHOS for their Helium 45/50 phones that never happened and left a bitter taste to the Helium buyers. Still, a 50 Diamond was filmed running with Lollipop at a tradeshow (it was CES or MWC 2015, I can't remember) but not many details were shown to confirm it's a finished product. Even if the Lollipop update comes there is no detail if it will be in the 5.0 branch or in the newer 5.1 which brings better support for dual SIM phones. So far, the experience with the Diamond device that I am testing (review in progress) is not too bad, the most irritating issue is the lag with the physical menu buttons (video coming soon) a few system bugs and crashes here and there and the default camera app which is not really convenient. Overall, the Diamond is a decent device but the Asus Zenfone 2 (ZE550ML) is superior on many aspects, for a similar budget... and it ships with a stable Lollipop 5.0 Having both phones, I'll eventually post an in-depth comparison. For the past months, ARCHOS has released many products, sometimes with new devices just being minor updates of existing models. Software support supplying regular updates and polished system to their customers seems quite neglected on most models. Let's hope it won't be the case for their flagship model ! 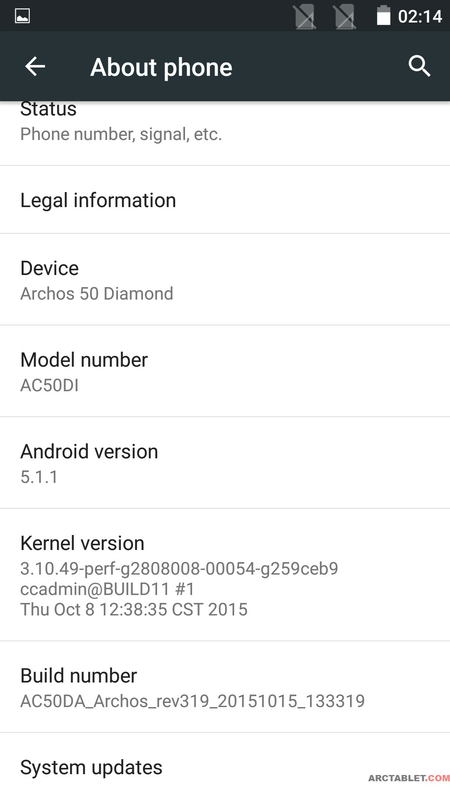 ARCHOS 50 Diamond owners, the news aren't too good: it seems the Android 5.x Lollipop update for the Diamond is not for tomorrow. - we have troubles with MCC/MNC recognition passed from SIMS which makes them believe to be in another country. This list leaves many problems yet to be fixed and that would probably means we are weeks away from a finished and stable Android 5.x Lollipop firmware, if that ever happens. As usual, we'll keep you updated if we hear some news about the firmware update. Good news everybody: Lollipop 5.1 Beta! Does anybody know if the stagefright issues are fixed with the Lollipop 5.1 Beta? 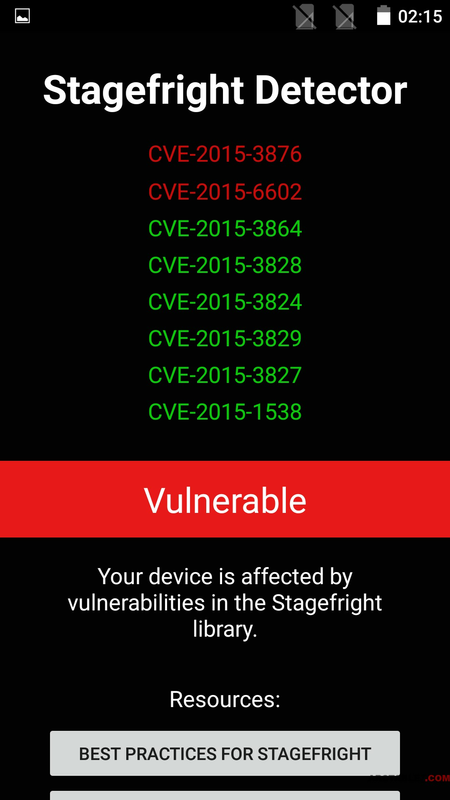 I did test on the first Android 5 Lollipop beta (build from 20151015) with Stagefright Detector, it fails on CVE-2015-3876 and CVE-2015-6602, see pictures below. Too bad, I hoped that switching to Lollipop would make my Diamond more secure. Interestingly today I have CVE-2015-1538 and CVE-2015-6602. So with switching to Lollipop I get rid of 1538 but have 3876 as a new problem. From the previous posts I understand that it should be at least almost definitively ready I think.